July’s first ever All Black test in Apia will attract a far bigger audience, and long before it is played has already received plenty more media coverage, but it’s hard to imagine a bigger or better night for Pacific music than Auckland’s annual Pacific Music Awards. 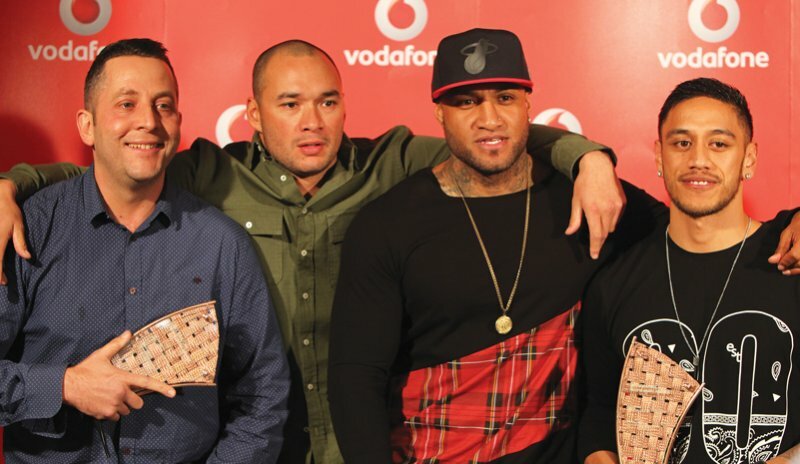 Staged inside Manukau’s striking Vodafone Events Centre on Saturday June 13, the 11th Pacific Music Awards saw performances from a variety of the night’s winners and finalists including Cydel, Team Dynamite, Erakah, TJ Taotua, Sid Diamond, Andrew Faleatua, Maryanne Ito and K. One. There was special tribute paid to Samoan brothers Pene and Amitai Pati and their cousin Moses Mackay, rather better known as operatic trio Sol3 Mio, and a moving Lifetime Achievement tribute to a dozen-odd early Herbs members, acknowledged for their first two albums as pioneers of South Pacific reggae. Auckland’s Mayor Len Brown has opened proceedings pretty much every year the PMAs have been held in Manukau but was overseas, so the formal welcoming address this year was handled by Councillor Alf Filipaina. MPs Hon Peseta Sam Lotu’iga Carmel Sepuloni, Kris Fa-afoi, Jacinda Adern, Su’a William Sio and Jenny Salesa were among the dignitaries in the audience. Aside from the two special tribute awards, the night’s big winners proved to be stalwart act Cydel with three trophies, Smashproof and TJ Taotua with two apiece. Smashproof (Tyree, Deach and Sid Diamond) smashed it with their socially poignant Survivors (featuring Pieter T) winning Best Pacific Song, and its Chris Graham-directed video judged the Best Pacific Music Video. 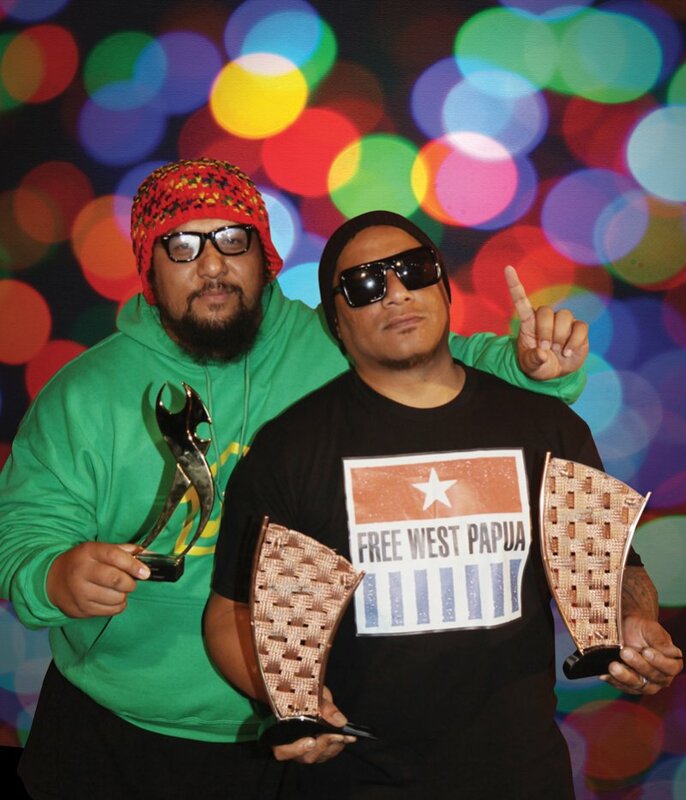 Singer/guitarist TJ Taotua picked up his first PMA trophies as Best Pacific Gospel Artist and also Best Pacific Male Artist. Veteran urban music duo Cydel (Pele Nili and Dee Letoa) have been in the winners’ circle before, back in 2008, but cracked it big time this year with their second album ‘Memoirs Of A Midnight Cowboy’ winning them trophies for being Best Pacific Artist, Best Pacific Group and the night’s big kahuna, the NZ Music Awards’ Tui for Best Pacific Music Album. Actually, and pardon the cliché, all involved were winners. This is a very different music awards ceremony, a real celebration, and more importantly a family and community-oriented celebration, styled in the loving and sharing nature of the Pacific Island peoples. One of the many likeable aspects is that many of the finalist artists literally bring their families, parents and children get to join in, enjoy the show and express their pride. The artists are supportive of each other too, they like the awards and the acknowledgement from the wider community, it means a lot to them. “We still attend when not nominated as it’s a family night out for us,” confirms Cydel’s Pele Nili. “I constantly encourage especially my non-Poly friends to come along because of the cultural essence they will witness on the night – the warm welcome, hugs galore, the safe family environment – can’t forget the intense humorous shenanigans, and of course the music! Extending the deliberate inclusiveness, this was the second 2015 awards gathering that the finalists (and their families) had attended. Recognising that such events inevitably acknowledge only the few award winners, organisers also stage an earlier finalist announcement ceremony. This April it was held in the theatre of sponsors Manukau Institute of Technology, with Auckland’s mayor there to shake hands and distribute certificates. Len Brown has long been a prominent supporter of the awards, and a strong advocate in ensuring ongoing Council support, dating back to his time as Mayor of Manukau City. Indeed he inadvertently (and memorably) brought the PMAs its first real mainstream media coverage, when he suffered a heart attack and collapsed during his opening speech in 2008. It was a moment of drama the organising team remember only too well –– but the show must go on as they say, and so it did. While many of the winners give first thanks to God, not much is sacred in the PMA which are as much about comic levity as they are honouring the music and musicians. Everyone, it seems, is a comedian –– not least the night’s cajoling and unflappably brilliant MC, Yolande Ah Chong. Former Tui winner Kas Futialo (Tha Feelstyle) was one of a hilarious crew of five who provided spoof video inserts from Malosi Pictures ahead of each award. Their DeLorean-inclusive Back To The Future skit that opened proceedings neatly set up the night’s theme of ‘‘navigating the future’. 14 of the fabulous PMA trophies, designed by Republik, were presented this year, the evening culminating with the Tui for Best Pacific Album which Cydel proudly took home. Pele Nili’‘s off the cuff acceptance speech was fittingly sincere and impressively honest. “This is probably the greatest day of my life,” he opened, before sketching his own story of poverty, primary school bullying, living in women’s refuge at 10 and going on to being a troubled teenager in the ’90s. (“The most horrific times of my life, but also the most exciting…”) All the while he was writing songs as his own way of coping and escaping. “I’m gonna say, ‘Yes, I deserve this one’,” Nili finished to generous applause. It’s been more than a decade now since the Pacific Music Tui was presented at the main NZ Music Awards ceremony. Back in 2004 RIANZ (since rebranded as Recorded Music NZ) moved to shift a bunch of less TV-friendly genre awards ‘off-site’, looking to find other venues for the presentation of Tuis for country, jazz, folk and Pacific music. The three genre-based Tui awards have since been presented at established annual festivals held throughout the year – folk in January at the Auckland Folk Festival, jazz over Easter within Tauranga’s annual National Jazz Festival and the country Tui as part of Gore’s week-long NZ Gold Guitar Awards, which coincide annually with Queen’s Birthday weekend. RIANZ encouraged the Pacific community to consider establishing their own awards and prominent Pacific Islanders within the NZ music industry were first sounded out before a committee was established to consider options. The first event was presented from an outdoor stage in March 2005 as part of the opening night of Auckland’s famous summer Pasifika Festival. Tha Feelstyle won three awards that year. Then an APRA employee, Petrina Togi-Sa’ena was a member of that original committee, and went on to become a founding trustee of the Pacific Music Awards Trust, which has since organised and staged the annual event. “It was alright, but we were tagging onto someone else’s event and so the Council and a number of others helped us to move to the venue in Manukau in 2006. There was a lot of discussion, but once it was done there was a sense it was a good thing, and there were enough elements for it to be its own event. A Samoan/New Zealander, Togi-Sa’ena is quietly spoken and delightfully humble, way too polite to stir things up. “There is still feeling today about the level of Pacific music representation at the NZMAs. I still have conversations with some artists who don’t like the separation and want the Tui to be part of the main awards, so I don’t think the conversation has gone away. She recalls that the Maori Album Tui was also to be ‘shifted out’ at the same time, but that never happened. The irony not lost on her. Things became more formalised in 2007 with the establishment of the Pacific Music Awards Trust to run the event, secure sponsorship and manage the budget. Three original members; Rev. Mua Strickson-Pua (chairman), Sina Wendt-Moore and Togi-Sa’ena remain as current trustees. Wendt-Moore was then at Pacific Media Network and these days works with Leadership New Zealand. Rev Strickson-Pua is a minister of the Presbyterian Church of Aotearoa NZ, and has been closely associated with our music industry since the 1990s. His son Feleti Strickson-Pua came to public attention with Nesian Mystik but had a long prior musical history including in bands Fa’atasi, Fresh Dialects, EPR and Bowtie Clique alongside various cousins. Strickson-Pua and his wife Linda acted as supportive parents. Sadly their fellow founding trustee Tom Etuata died two years ago, and Noma Sio has stepped down to avoid any conflict of interest when her husband became a nominated artist. Presently then there are only three, though new trustees are expected to be formalised later in the year. Last year the Trust staged the 10th anniversary of the standalone PMAs, a truly celebratory occasion. 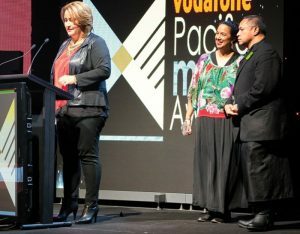 It meant a big step up in moving to the 1200-seat main arena of the Vodafone Events Centre – up until then the awards had been held in the Manukau complex’s Genesis Theatre, which can hold about 700. The plan was to return to the smaller space for 2015 but ‘public pressure’ obliged a rethink. The event is entirely reliant on sponsorship. Daunting enough at the $60 to $70,000 it consumed in the early years, the production budget has now risen to double that amount, but struggles to keep up with ever increasing costs and quality expectations, further exacerbated by the move to the main arena. There is by now an extensive ‘family of sponsors’, though not all provide funding. Among those lending their support from the beginning were the music organisations APRA, RIANZ and the NZ Music Commission, plus the then-Manukau, now-Auckland Council. The vital naming rights sponsor position has proven rather more problematic with few relevant organisations being able to sustain such an investment for long. Even the most enduring such relationship has been challenged by wider economics. When Vodafone took over Telstra-Clear the telco also took on branding of the Manukau stadium. Long time backers on the NZ Music Awards, the brand agreed to become the naming right sponsor for the PMA’s 10th celebration. It’s still a ‘trial’ with no future guarantee, but the event was again branded as the Vodafone Pacific Music Awards this year. Of course mainstream television coverage is still the outcome most coveted by investing sponsors, but remains one of the hardest outcomes for the PMAs to ensure. Tagata Pasifika have filmed the event each year for broadcast on their TVNZ weekend show, the first few just a highlights package, growing to a half-hour show and for the last few years a one-hour special. They have also been doing AV presentations for the night. Structural changes at TVNZ mean that 2015 is the first year with the Tagata Pasifika team no longer an in-house production unit, however the status quo has been maintained with the ceremony still broadcast on the TV One show this June. It’s unknown if further changes will occur next year that might make things harder still. Another notable value-add with Tagata Pasifika’s involvement has been in having the TV show re-broadcast in the Pacific Islands. That quite possibly catalysed the addition of an International category to the ceremony last year. Togi-Sa’ena says it was artists’ pressure that stimulated the new award introduction – Australian acts in particular asking to be included. Describing entry numbers for the Best International Pacific Artist as static with three finalists this year, she admits they have a bit more promotion to do on that. Hawaii-based Samoan/Japanese singer Maryanne Ito performed and proved a popular winner. There are regular requests to add more categories and awards, a ‘producer’ category being one common suggestion, but with a show that touches three hours the feeling is that the limit has already been reached. And it’s not simply time but the associated costs – trophies, AV, more people, more judging, all requiring more sponsorship. Aside from recognising the various musical genres, there are of course, also issues created by the one ceremony needing to include elements from seven Polynesian islands; Tonga, Samoa, Cook Islands, Niue, Fiji, Tokelau and Tuvalu, as best as it can. Samoan artists almost inevitably dominate. As Togi-Sa’ena points out, they have no control over the list of finalists (which is determined by a secret panel, numbering up to 20, of artists, producers radio DJs and so on), and numerically Samoans are predominant among the NZ population. Performance opportunities are carefully allocated to avoid challenges of bias, and similar care is needed in terms of VIP guests in order to ensure even-handed representation. Ground-breaking south Auckland producer and musician Phil Fuemana is remembered annually with the presentation of the Phillip Fuemana Most Promising Pacific Artist Award. Past winners have included Matthew Salapu Faiumu, Sweet & Irie and Cilla, with this year’s trophy going to the sweet-voiced Donell Lewis. This year’s 11th outing of the PMA took the theme of ‘navigating the future’. Rev Strickson-Pua explains the message. “We are looking to celebrate and nurture the new era and generation of Pacific music. This was also reflected in our 2015 finalist list, with our largest number of total finalists, and also highest number (close to half) of first time finalists. And given we celebrated 10 years last year, 2015 is about looking to the future, a new decade and the new era of music. Despite the conspicuous growth, wider spread and increased professionalism of the awards ceremony, the aspirations haven’t really changed according to Togi-Sa’ena. In fact by many measures there is already insufficient money to run the PMAs. As well as being a trustee Togi-Sa’ena has the role of production manager, though she is shy about claiming the actual title of ‘director’. Until September last year she was also holding down the fulltime role of Member Services Manager at APRA-AMCOS, leaving her with evenings and weekends to work on the PMAs. She had been part of the organisation for 20 years. Togi-Sa’ena is hopeful that her various other activities in the music industry, which include a partnership with Te Awanui Reeder (Awa) in Soulnote Agency, will mean she can avoid returning to a 40-hour week, begging the question, isn’t she getting paid by the Trust? She describes feeling like a bit of a domino at times, but is being wholly candid when she says that she loves the artists and loves the award events. It’s a sentiment shared by Strickson-Pua. For Togi-Sa’ena the focus for this new decade will be on providing more professional development, encouraging up and coming artists. She sees the trust is an important source information, support and advice about the industry. “Petrina correctly notes the kaupapa of spiritual, cultural and political praxis,” agrees Strickson-Pua. “It’s also about our aroha, our alofa, our agape to our Pacific artists, our families, our communities and nations, balanced with our cultural and professional commitment to our music industry and Aotearoa New Zealand. Adam Holt, chairman of Universal NZ, served on the awards committee in the first couple of years and says the team had to really fight to get it to a level where it could be sustainable.